This greets me every morning! I am superstitious by nature. Well, probably by nurture given how prevalent superstitions were in my family when I was growing up. In any event, while I try to fight most superstitions, I am occasionally seen tossing salt over my shoulder, NOT walking under ladders and, as anyone who knows me will attest, NOT mentioning a no-hitter by name unless it’s being pitched by someone I don’t want to succeed. Let me share a story I’m sure I’ve shared before. It’s a Sunday in October of 2004 and the Red Sox have lost the first 3 games of the ALCS to the New York Yankees. The third game, having just ended the evening before, was an especially painful thrashing that saw the Red Sox lose 19-8. That Sunday, I went with my family to a birthday party for one of my aunts. Even though the Patriots were also playing and everyone was happy to see each other, it felt more like a wake. All people were talking about was how the Red Sox were going to get swept by the Yankees that night. My parents and I think we’re the only people in the house who aren’t convinced the Red Sox are going to lose, until my cousin’s boyfriend, who was also a bartender around the Fenway Area, starts telling everyone that the Red Sox could win the entire ALCS. He basically spends the afternoon telling everyone the same thing Kevin Millar famously told anyone who would listen at Fenway that day. So while he didn’t use the same words as Millar did above, the sentiment was the same. If the Sox could win on Sunday, Pedro was pitching game five and Schilling was pitching game 6…and it could all come down to game 7. And we all know what happened. We left that party invigorated and excited for the game to begin. After game 4 went the way it did, I took myself to work the next day…in the same clothes I had worn to the birthday party. (Hey, the game ran late, I got up late and grabbed the clothes I had easiest access to.) I came home that night, didn’t get changed and watched the Red Sox beat the Yankees again. As I sat down to watch game 6, I looked down at my clothes and thought “I really need to go put on what I wore for the last two games” and I did. So for games 4-7 of the 2004 ALCS I wore the same outfit (well, except for the underwear…I figured the Baseball Gods would understand I needed clean underwear…) and things worked out swell for the Sox. 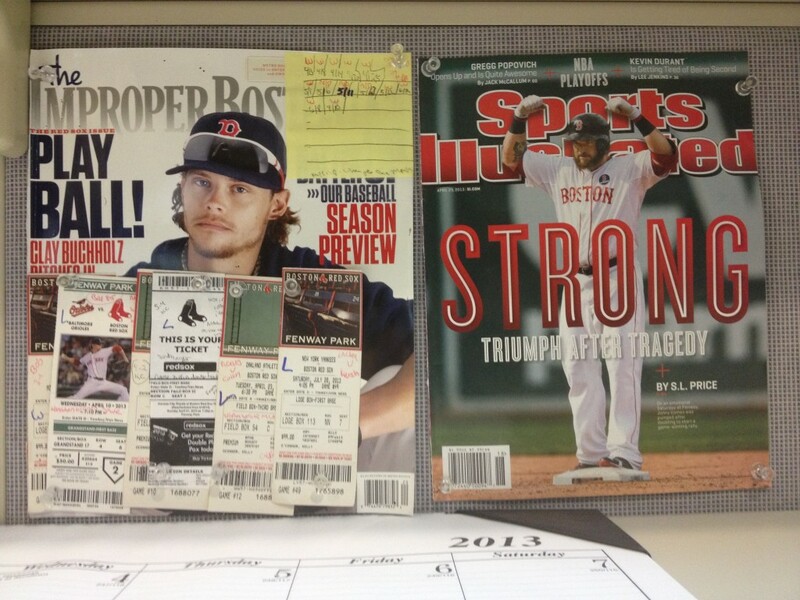 After the Red Sox won it all in 2004, I realized I could let go of a lot of my baseball superstitions. (I will never be able to truly let go of not mentioning a no-hitter by name. I absolutely know this is ridiculous, I promise you.) I’ve spent the better part of the last 9 seasons (including this one) rolling my eyes at people who worry that the same fate will befall the Sox as it has in the years before 2004. But September of 2011 shook me. More than I thought it had. Here I sit, night after night, watching this absolutely amazing Boston Red Sox team come back from deficits, pound good pitching and act like nothing around them fazes them at all and still I worry. So the pictures remain, Clay came back the other night to win his tenth game of the season and Jonny Gomes is doing just fine, thank you. (Because he is, according to this, Bruce Willis from Unbreakable.) And yet I still worry. Worry is the wrong word. I’m not worried. I believe this team is winning the division and has a damn good chance of winning the World Series. I’m just trying not to mess with anything karmically that could screw things up. What that means specifically, I’m not yet sure…but I’ll say this: Neglecting this blog (as well as not going to nearly as many games in person as I usually do) hasn’t exactly hurt the Sox this season! I have no intentions to purposely stop the blog…but now you know why there might be a few more long periods without an entry! Of course, all that goes out the window once the post season is here and new superstitions take their place. Magic number = 8. Single digits, baby! My Sistahs remind me that we haven’t had a postcard shower in a while and the beginning of this season is the perfect time to rectify that. Before we go on, I wanted to share the history of the Postcard Shower with those unfamiliar with it. The BOSTONS was formed to show the guys on the team how much the fans support them. The definition of our “postcard shower” was to get at least 10 of the women to send out 10 postcards with positive messages of support written on them to the player we all agreed needed it the most. According to the Boston Globe: “(As of September 8th) Since Todd returned to the second spot in the order Aug. 21, he is batting .333 (18 for 54) after hitting .177 in the previous 37 games” . We BOSTONS know the truth! By that week of August 21st Todd was already receiving his postcards! We firmly believe that the vocal support of The BOSTONS was a major factor in the wonderful way the guys came through for us in 2003 and ESPECIALLY the way they came through for us in 2004 and we know that tradition will continue! Taken from Boston.com many years ago. Used without permission and without a memory of who the photographer is. This is Todd Walker cleaning out his locker in October 2003. If you enlarge the photo, you will see a postcard taped to his locker. A white card with a yellow smiley face on it. Three of the “Babes” (including Booklady and yours truly) sent Todd ‘smiley face’ postcards. So we use this photo as proof that the showers meant something to the guys. There was also a quote from Gabe Kapler in 2004 (thanks to Sistahs Soxcruiser and Brenken for it). As you can see, we feel strongly about the power of our support. Over the years, various players have been recipients of our postcard shower and in 2004 we started showering the entire team when they needed it. Right now, the entire team needs it. Choose a Player and send him a postcard (or five or ten) of support. If we start now we can shower them for this four game homestand and keep it up while they’re on the road so they come back to all the love from the fans. Red Sox Nation is a much larger (and diverse) group than the BOSTONS were…so men and women getting together to show ssupport for their team will make a greater impact, yes? It’s a great way to show the team we’re behind them while feeling like we’re doing something to help. So grab a pen, some postcards and some postage and start writing! When all else fails, there's always Bill Hall. Photo courtesy of Kelly O'Connor/sittingstill.net and used with permission. So yesterday was one of those games that I missed because of other obligations and then didn’t mine missing at all. I will be watching tonight’s game so Mr. Buchholz can feel free to pitch another no-hitter or, heck, just a one-hitter will work too. I won’t mind. I guess if one thing upset me about missing the Sox it’s that I missed Bill Hall pitch a perfect ninth. Have to love a position player coming in and getting the job done. (I lie, you realize. The idea of a position player finishing a game, and the fact that TWO have done so already this year, makes me want to bang my head.) I dvr’d the game but might just fast forward through it to see Kevin Millar hassling Tito. And, as much as I love the dude and I promise you I adore the guy, the Sox are 0-2 in the Kevin Millar on NESN era. Something’s gotta give. One pitcher-related note: Ted Lilly: You cheated. Casey Blake isn’t the bad guy because he called you out on it. You’re the bad guy because you did it and John Hirschbeck is the bad guy because when Blake questioned it he refused to do anything about it but, make no mistake, you did it. We all know you did it and pretending you didn’t makes you look a bit, well, makes it look like you think we’re all stupid. We aren’t. Folks who weren’t Casey Blake picked up on it, most specifically CJ Nitkowski. Also, saying something along the lines of “everyone cheats” doesn’t make what you did right. If you don’t want people calling you out as a cheater, here’s a tip: don’t cheat. I have my cranky pants on today. I spent a few hours fixing my wireless that was down almost a day (the horror, I know) and I think my Mac is well on its way to its demise. I’ve already had folks offer me PC laptops as loaners for the day the Macbook Pro finally dies but, man, I will miss the Mac when it finally kicks. When I finally get back to the ranks of the gainfully employed, first thing on the list will be to get a new one, I think. (Hey the phone bill can wait, right?) So while I will definitely be trying to continue posting every day there might be a time when that stops while I get my house in order, so to speak. As of right now, though, I’m still planning the Tuesday night live chat! My technology failing me tends to get me on the crabby side, especially since I can’t really do much about it right now, so I chose to hold off on blogging until the crankiness was gone…and then I read about Ted Lilly and it all came roaring back. I think I’m good now! Tonight I’d like a well-pitched, offensively active, Sox win. I don’t think that’s too much to ask. Casey Kelly is now on Twitter @cpk3. Following him and Luis Exposito @Expo2323 is highly entertaining! Photo courtesy of Kelly O'Connor/sittingstill.net and used with permission. I’m not of the “well, it’s the Royals so the Sox will roll over them” mind, never have been, but these games could be a lot of fun! Last night was not a lot of fun. Okay it was a little fun. Seeing Bill Hall go yard is always fun. Having Kevin Millar on the pre and post game shows and reminiscing about 2004 was fun. Watching Daisuke Matsuzaka pitch like the game in Philadelphia didn’t happen? Not so much fun. But there is no time to dwell. There are still three games against the Royals to be played and won. The Sox just need to get back up on it. Tim Wakefield, Clay Buchholz and Jon Lester will be pitching those games. We have every reason to be hopeful! Special attention should be paid to Saturday night’s game…Zack Greinke v Buchholz. I know that Greinke has been snakebitten by the rest of his team and that he’s this fabulous pitcher who MLB is already getting the HoF plaque ready for, but I kind of like our guy too. First, though, there’s Wake tonight. The next streak has to start with a win and I think Wake’s just the guy to lead them. Meeting Millar in 2003. I was very excited to meet him which explains why I look so nervous in this photo. 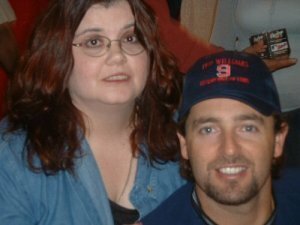 Kevin Millar has held a special place in my heart for a long time. Before his time in Boston began in 2003, I had watched him on “The Best Damn Sports Show Period” talking about how he was treated for being a ‘scrub’ in 1994 and how difficult it was to decide to play during the strike. Immediately, I was drawn to him and I was excited to see him on the Red Sox. I knew he was no All Star but I’ve always had a penchant for bench players so I had no higher hopes for him than he be successful on his own level and help the team as much as he could. 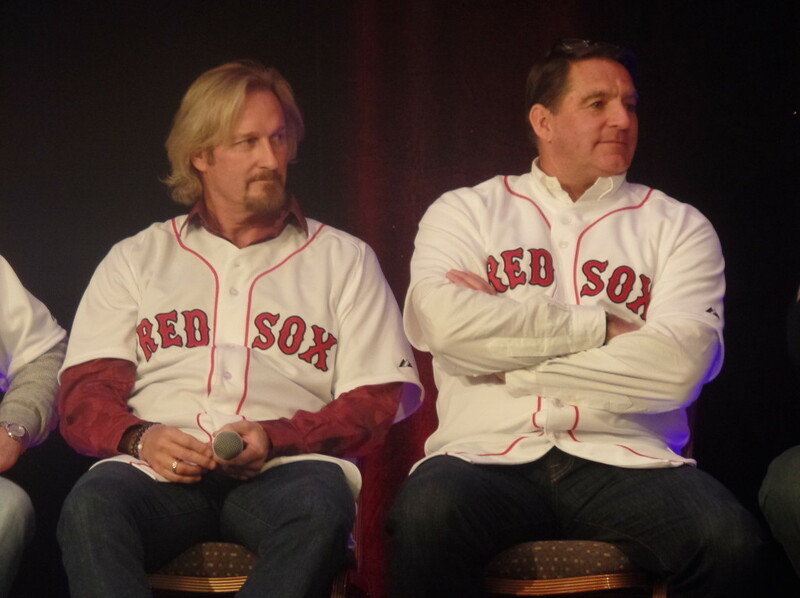 At the time, I was a very active contributor to the Red Sox Fan Forum message board and the collective interest in Millar (and Todd Walker and other members of the team) turned into a website that I created (numberfifteen.com – now defunct). The site became very popular and I ended up in contact with various people who knew Kevin (including his mom and a former coach). Kevin himself even left comments a few times. He was very gracious and seemed to appreciate the love of the fans. So he really won my fandom. Home today with nothing to do but stay in bed and hope this stupid virus, or whatever it is, goes away soon. So I have the MLB Network on for the better part of the day. Numerous viewings of their “MLB Tonight” show as well as their “Prime 9” shows. Over and over and over again. (So once the regular season begins, we get actual games during the day, right?) In the midst of these repeated showings, though, is a game from 1981. White Sox at Red Sox. Carlton Fisk’s first game back at Fenway. I’m sure, if this game was on television, I watched it (MLBN’s version is the White Sox feed. Harry Caray and Jimmy Piersall.) but I don’t have a clear memory of it so it was fun to watch parts of it. (Not so much fun? Red Sox lost 5-3.) Interesting was the fans reactions. Lots of cheers, for sure, but as Piersall and Caray were talking about all the fans cheering and giving Pudge a standing ovation, the cameras caught many fans NOT standing or cheering for Fisk. He certainly got more cheers than boos, but those boos were loud enough for audio equipment from 1981 to pick them up. I don’t know if I know anyone who was at that game (my friends Dori and Dale come to mind as possibilities – let me know ladies!) but I wonder if, given that the Red Sox lost the game, if the fans there look at that game as being something special? Something they’re happy to have witnessed in person. The loss wold ruin he entire thing for me. So thinking about all the times I’ve been at a game where a beloved ex-Sox player returned, I figured I’d reflect on the three best here. Why not? Kevin Millar returns to Fenway. Photo taken by Kelly O’Connor/sittingstill.net. Used with permission. Dave Roberts returns to Fenway. Photo taken by Kelly O’Connor/sittingstill.net. Used with permission. * Dave Roberts returns as a Giant: June 15, 2007. There’s no question that I wanted the Sox to win this game. My blog entry that day read, in part, “Dave is the main reason I bought the ticket for the game tonight. Having written that, I hope my boys destroy his team.” I was past excited at the idea of seeing Dave Roberts again. I literally cried when they introduced him. I was so struck by the sight of him and the memory of what he helped accomplish, that it took a bit of the sting away from the sea of Barry Bonds jerseys around me. Dave Roberts will always have the ability to bring me to tears without doing anything. The party line you hear in Boston is that Dave Roberts will never have to buy himself a drink when he’s in Boston. I’ll tell you what, if he asked me to, I’d take someone out for him. What? He’s a nice guy, he’d never ask. Oh, and incidentally, Sox won this one too: 10-2. Pedro returns to Fenway. Photo taken by me! * Pedro Martinez returns as a Met: June 28, 2006. I had to be at this one. Absolutely had to be there. I sat in the bleachers, under the scoreboard. UNDER it. And because I knew I wouldn’t be able to see much during the game, I made sure I got there early for BP. I brought a friend from work and the two of us parked ourselves as close as we could so we would get a good view of Pedro when he walked across the field to warm up. I don’t have to explain to most Red Sox fans what Pedro meant to me when he was with the team. When he didn’t re-sign with the Sox, I was sad but not mad. Pedro made it clear he was looking for the big payday and long-term contract. I was pleased he didn’t go to that other team in New York, so there were no hard feelings that he came back to Boston in Mets colors. Being the emotional sort, I cried when he came out and I cried when they announced him and I cried when he took the mound (I also cheered each time). But after the tears, I wanted the Sox to knock him around…and they did (10-2). The two most vivid memories from that night: Finding out that Peter Gammons had an aneurysm blew me away and took some of the thrill out of the evening. One of my parents had a brain aneurysm burst when I was in grammar school and, thankfully, fully recovered. But it’s still frightening and confusing and, as much as Gammons pisses me off on almost a daily basis these days, I felt like someone punched me in the stomach when I heard he fell ill. My other strong memory was getting a text message during my ride home telling me that Pedro said he didn’t care about the outcome of the game, he just cared about the fan reaction. That was vintage Pedro for you. I was sorry to see him get as beat up as he did…but I still felt like I got the best of both worlds. We got to show Pedro we still loved him and then we got to show the Mets which was the better team. Wednesday at 7pm, MLB.tv, MLB Network and NESN will all be airing the first Red Sox/Twins spring training game of the new season. If you are near a computer or television at 7pm, you have many options to check out the team for the first time this year! But now he loves Boston. Being a bench player is exactly what he wants. He’ll be a good boy. This guy makes my brain hurt. If we’re going to recycle fourth outfielders, I’d like to put my vote in for Gabe Kapler, thanks. Guy appreciated every moment he was here and could be just as productive (if not more so) than Payton. Just say “no” to the guy who antagonized Tito in order to get off the team, Theo.